The Role of Piping Systems in Fire Risk | Lubrizol Advanced Materials, Inc. Oxygen, heat and fuel must always be present for a fire to occur. Combustion just isn’t possible without sufficient oxygen. So how do you know if a material will sustain combustion? A material’s limiting oxygen index, or LOI, is a measurement of the percentage of oxygen in the air that is required for a specific material to sustain a flame. The percentage of oxygen in the earth’s atmosphere varies but is typically about 21 percent, according to the National Weather Service. The higher the LOI, the less flammable something is. 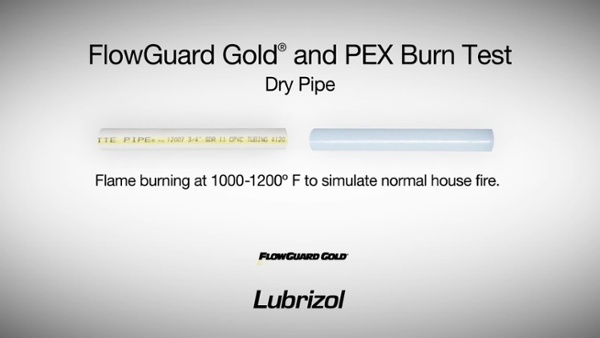 FlowGuard Gold® CPVC piping does not sustain a flame It will burn when it comes into contact with other building materials but will stop burning when the flame is removed. This is not the case with PEX piping. During a recent test, both CPVC and PEX piping were exposed to an open flame. The CPVC pipe developed a visible char as a protective barrier on its surface, reducing the rate of burning. The PEX pipe caught fire and continued to burn to the point of dripping flaming PEX material even after the original source of the flame was extinguished. Watch a flame test with CPVC and PEX below. Testing conducted by the United States Testing Company revealed that smoke generated by CPVC is no more toxic than smoke generated by wood. FlowGuard Gold CPVC piping – because of its high LOI – is a better choice for builders who are concerned about fire safety. CPVC is trusted in residential fire protection systems using our BlazeMaster® CPVC, FlowGuard Gold CPVC and BlazeMaster systems, which are frequently installed side-by-side in residential buildings. All FlowGuard Gold pipe and fittings, therefore, are acceptable for use in return air plenums. Interested in using FlowGuard Gold CPVC as a fire safe piping system for your next build? Contact us to speak to a representative.